Michelin is known for producing good quality tires, but the Michelin Pilot Sport A/S Plus tire has taken tire performance to a new level. It takes a combination of unrivaled all-season performance and tread life, and matches it up with a smooth, comfortable ride to give high-end car owners an option they didn’t have just a few years ago. An advanced Tri-Fusion tread compound, which molds three different types of tread compounds together on the tread, creates a directional tread design with high performance handling and traction in all types of weather conditions. This high-tech manufacturing process holds the compounds side by side without any separation. The Pilot Sport A/S shows its abilities in providing great traction in dry, wet and snowy surfaces. Dry handling is assisted by the special tread compound in the shoulders, which make it perform quite well on dry surfaces. The compound between the two shoulders and the center rib assist with wet and snowy surface traction. There is also a center rib compound which provides assistance in traction on wet roads. High angled lateral grooves increase wet road grip and virtually eliminate the risk of hydroplaning. The solid circumferential rib reduces road noise and enhances steering response and feel. This Michelin tire is amazingly quiet and you’ll never have any difficulty carrying on a conversation with others in the car. Inside the tread, Michelin has utilized what they term Filament AT Zero Technology to surround the twin high-tensile steel belts with a polyamide strand to ensure longevity and better durability. It also increases stability at higher speeds, something driving enthusiasts can appreciate for sure. Overall, the Michelin Pilot Sport A/S Plus is at the top of its class for high performance handling and ride quality. Whether the roads are dry, wet or snow covered, the A/S Plus doesn’t let you down. 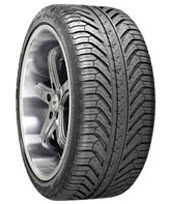 Treadlife is well above average for this type of tire, and value for the money is excellent. Prices on the Michelin Pilot Sport A/S Plus Tire range from about $140 for 16 inch series tires to approximately $300+ for 22 inch series tires. If we have a valid Michelin coupon for this tire, it will be shown below. You can find other tire discount coupons. Who Are Michelin Pilot Sport A/S Plus Tires Designed For? Michelin has designed the Pilot Sport A/S Plus for the drivers of high-end sports cars, coupes and performance sedans who are seeking a high performance all-season tire that offers uncompromising handling and traction, to go with a quiet and smooth ride regardless of weather and road conditions. Michelin Tires stands behind the Pilot Sport A/S Plus with a 6 year or 45,000 mile treadlife guarantee. (This warranty is reduced to half if you have different sizes on the rear than on the front.) Tire uniformity is warranted for one year or the first 2/32 inches of wear. Materials and workmanship are guaranteed for 6 years and include free tire replacement during the first year or first 25% of wear. Michelin then prorates out the amount for the remainder of the warranty period down to the final 2/32 inch of useable tread life on the tires. There is also a 3 year flat tire changing package included with this model, and you also receive Michelin’s 30 day satisfaction guarantee.